Make The Best Pancakes Ever With These Simple Tips! - Highwood Crossing Foods Ltd.
Make The Best Pancakes Ever With These Simple Tips! They’ve certainly been a favorite around our home for as long as I can remember, both when I was a kid, and later when we had children of our own. And based on the popularity of our organic pancake mixes, I know that pancakes are a family treat in lots of other homes as well. When it comes to pancakes, I consider myself to be well-seasoned. Over the years, I’ve cooked and served thousands and thousands of pancakes… not just at home for family and friends, but at large group events as well, like fundraisers for local service clubs, stampede breakfasts, in-store product demos and at numerous farmers’ markets where we’ve sold our products. One year, to attract new retail clients, we rented a booth at the Edmonton Gift Show where we made pancakes, using our mix, for 8 hours a day, 4 days in a row. I’m sure we served 10,000 pancakes at that event alone! Our Muffin & Pancake Mix is made with organic whole-wheat flour as the main ingredient and it makes hearty stick-to-your-ribs farm-style pancakes that fill you up. Highwood Crossing mixes are healthy, fresh, minimally processed, taste great and use only the best possible ingredients. So, if you’re used to commercial mixes that have white flour as their main ingredient, then you’re in for pleasant surprise! I know it’s tempting to use a bit of this and a dash of that, but for the best results follow directions and carefully measure the ingredients. Although some will recommend making and refrigerating the batter days or hours ahead of cooking, I disagree. As with most things related to food, fresh is usually best. If you make the batter too early in the process, the flour will soak up all the liquid and your batter will be much too thick, more like porridge than batter. I have found that letting the batter sit for about 10-15 minutes is enough time to let the gluten in the flour relax a bit and the baking powder do its thing. One of the most common mistakes that people make is to over-work the batter. Add dry ingredients to liquid and incorporate together quickly, with as few strokes as possible. Once all the dry mix is combined with the liquid-STOP-even if there are a few lumps. Let the batter sit and don’t stir the batter again. When you are ready to start cooking, just scoop the batter out of the mixing bowl with a ¼ cup measure directly onto the hot, greased griddle. Nothing ruins pancakes faster than a griddle that is not hot enough. I like to set the temperature at about 400°F. To test if your griddle is hot enough, sprinkle at few drops of water on the surface. The drops should jump, dance, sizzle, pop and evaporate immediately. Once your griddle is at the right temperature, melt a little butter on it to prevent the pancakes from sticking. Wipe away the excess with a paper towel (careful you don’t burn yourself) and save the paper to grease the griddle again if needed. If you are cooking large quantities non-stop, you will find that your griddle can gradually loose heat. If this happens, stop cooking and put a large baking sheet or pan over your griddle and give it a couple of minutes to come back up to heat. It shouldn’t take long and the quality of the pancakes will be much better. This is also true if you are cooking outside as even the gentlest breeze will cool-down your griddle. 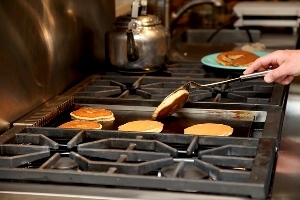 Nothing tastes better than a fresh, hot pancake straight from the griddle. If you can, cook and serve your pancakes this way. Your family and guests will thank you for your efforts. Pancakes that are held in a warm oven or chafing dish tend to get soggy or dry out and are not as nice as pancakes straight from the griddle. Add 2 Tbsp. of distilled white vinegar to the milk and allow it to sour for 5-10 minutes before adding the dry mix. You won’t taste the vinegar in the pancakes, but the vinegar helps to activate the baking powder and will make your pancakes even more light and fluffy. Another trick is to separate the yolk and egg white of an additional egg. Beat the egg white until soft peaks begin to form. Gently fold the egg white into the batter and allow the mix to sit. The egg white will help to create a wonderfully fluffy pancake. With these few tips, I hope you and your family will enjoy perfect pancakes for years to come! If you have some tried and true tips that you’d like to share, please let us know and we will pass along your suggestions.